Roger Bresnahan, legend has it, was unhappy with the decision and was determined to get it reversed. The catcher and manager of the St. Louis Cardinals, Bresnahan was quick to flash his temper when sticking up for his players, but the men in blue he was confronting were not umpires. They were railroad conductors. The Cardinals, having just lost to rookie Grover Cleveland Alexander and the Phillies that afternoon, were taking the overnight train from Philadelphia to Boston and found themselves right behind the engine. Experienced rail travelers, they knew this was not the place to be. The players settled in their sleeping berths, and the train pulled out at 7:24 p.m. Sleep was impossible — with the thunderous roar and incessant whistling of the steam locomotive, and cinders drifting through the windows. On top of that, a record heat wave was going on. Bresnahan had leverage. Baseball teams were steady railroad customers, and he rode the train under protest … or did he? 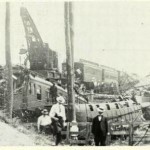 There were different versions reported about this ill-fated run of the “Federal Express” on July 10-11, 1911. When the train reached railroad yards in New York, its cars were reshuffled. Daniel Kissner, the train’s brakeman, later said the Cardinals’ Pullmans were moved to the rear in response to Bresnahan’s complaint. Bresnahan and the players said the switch was random, done because it was easier for the railroad. At 3:32 a.m. on that steamy Tuesday morning, the Federal Express jumped off the rails in Bridgeport, the massive locomotive hurtling over the embankment and smashing onto Fairfield Avenue, car after car forming a mountain of smoldering wreckage, burying the passengers. At that moment, the St. Louis Cardinals became Connecticut’s team — first responders at one of the worst transportation disasters in state history. Theirs were the only cars that remained on the track, and the 22 members of this professional baseball team scrambled down the 18-foot embankment, some in pajamas and bare feet. “Many a victim of the wreck owes his life to the promptness of the St. Louis National League Baseball team,” reported The Hartford Times the following afternoon. As it was, 14 people lost their lives, and 47 were seriously injured among the 150 passengers. By all accounts, the death toll would have been higher, the suffering of survivors prolonged, had Bresnahan not exhorted his players to quick, unselfish action.